The White Rock Outback Traveller uses the traditional design features of the Classic Outback Hat, and adds a creative, edgy twist. 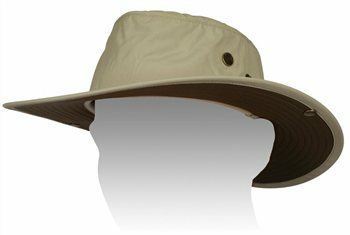 The brand new Outback Traveller hat is a stylish design made from water resistant nylon and incorporates a curved snap up brim for maximum sun protection. With all the features of the Classic Outback including Bug Off, Hydro Cool Pouch, passport pocket and adjustable chin cord, this is an extremely lightweight alternative for those packing light - at 110 grams this is the ideal hat for travelling. I have to ensure that I don't get too much exposure to sun ad fing the White rock wide brimed hats brilliant especially the ones with the crystals around the head to keep you cool. It's great that White Rock have now added the 'bug repellant' attribute to the hat. Haven't had a chance to try it yet and to be honest I'd say it looks ideal - however the XL is just a tad too snug on my head so really if you're at all concerned grab the size above XXL. It states the XL is right for a 61cm / 24" head - I'm a fraction over that at 24.2cm and prefer loser fits so... anyway it's light, it does fits and should do the job superbly. This is a very nice hat and the size XL was generous (supposedly 59-61 cm, I am 60cm and was a fraction too big). However remember in a hot climate you don't want anything tight. The crystals really do work and give you a cool, moist feel around your forehead area. A headstrap is included and fits nicely inside under a flap when not using it. But its necessary if you are going at speed in a boat or a convertible car or you might lose the hat! Top part of hat is a little saggy but loose material probably won't keep a stiff shape for long Ior its my head shape). Overall best hat I could find for price and practicality, spending 2 weeks in a hot sunny climate.